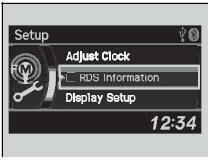 1.Press the SETUP button and rotate to select RDS Information. 2.Each time you press , the RDS Information switches between on and off. 1.Press the FOLDER bar or the CATEGORY bar to display and select an RDS category. 2.Use SKIP or SCAN to select an RDS station. 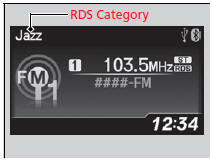 The ST indicator appears on the display indicating stereo FM broadcasts. Stereo reproduction in AM is not available. Press the MODE button on the steering wheel. 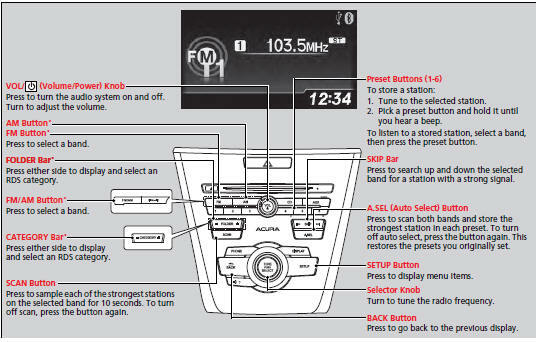 You can store six AM stations and twelve FM stations into the preset button memory. FM1 and FM2 let you store six stations each. Auto Select function scans and stores up to six AM stations and twelve FM stations with a strong signal into the preset button memory. If you do not like the stations auto select has stored, you can manually store your preferred frequencies.